The American Red Cross, a nonprofit humanitarian organization dedicated to helping citizens prepare for and respond to large-scale emergencies, was formed in 1881, modeled on humanitarian work by volunteers in the Crimean War (1854-56) and the later Austrian-Italian War (1859). 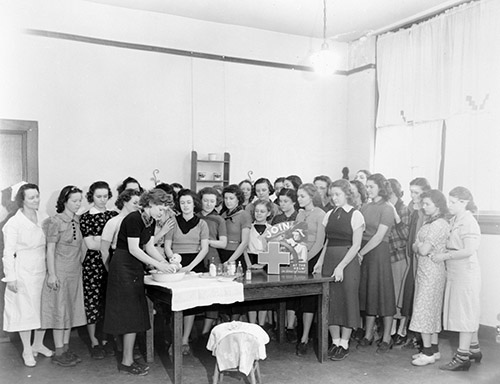 In North Carolina, women often took the lead in organizing Red Cross chapters. Some of the state's first chapters were formed in Buncombe, Rowan, and New Hanover Counties. A Wilmington chapter was organized on 10 Nov. 1908 and an Asheville chapter on 17 Apr. 1911. These early chapters were formed to help meet the needs of individual families affected by crises such as natural disasters or fires. The Salisbury chapter dates to the beginning of World War I and later played a leading role in the establishment of the blood donor program. An American Red Cross chapter was organized by local women in Raleigh in 1916; the following year it founded a "colored auxiliary" for African Americans. Chapters were organized in Durham and Greensboro in 1917. Among the North Carolina Red Cross's early projects were the opening of a tuberculosis sanitarium near Wilmington just prior to World War I, the operation of canteens at railroad stations for World War I servicemen, and aid in the influenza epidemic of 1918. First aid and lifesaving classes were also offered. In some communities around the state, the Red Cross in the early years provided public health nurses, home classes in infant care and nutrition, and care for disabled veterans. It provided notable assistance during a hurricane in 1933 and in railroad accidents in 1943. 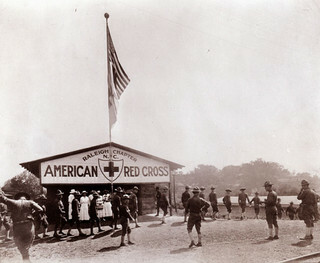 Many Red Cross chapters were formed in North Carolina during the World War II era and afterward. By the early 2000s there were more than 50 chapters in the state, with service districts covering all 100 counties. The Greater Carolinas Chapter is North Carolina's largest Red Cross chapter, serving nearly 1 million people in Charlotte and surrounding towns. The Red Cross has been irreplaceable during North Carolina's most horrific natural disasters, particularly major hurricanes. Probably the most visible Red Cross-sponsored events, blood drives, are often carried out by volunteers in churches, on university campuses, and in several other settings. The Rowan County Red Cross Chapter was renamed the Elizabeth Hanford Dole Chapter in 1995 to honor the Salisbury native who was then the president of the American Red Cross and who was elected a U.S. senator from North Carolina in 2002. Foster R. Dulles, The American Red Cross: A History (1950). Red Cross station, Raleigh, NC, World War I Era. From General Negative Collection, North Carolina State Archives, call #: N-64-8-154. Available from http://www.flickr.com/photos/north-carolina-state-archives/6100675721/ (accessed October 12, 2012). 1 January 2006 | Dysart, John B.